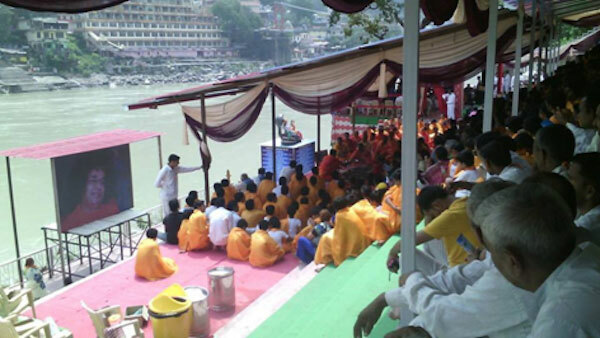 The first day of the Sri Sathya Sai Ghat inauguration was filled with ritualistic offerings to Mother Ganges. It was so nice to see Brother Veda Narayana and team from Prasanthi take up the whole proceedings with excellent rendition of relevant mantras for the occasion. It was so nice of the think tank to choose these noble souls instead of so called BIG priests many of whom have shifted their loyalties, after getting fame and name courtesy of Swami. The live proceedings of the whole ceremony was icing on the cake and the whole team of SAIONE APP, Sri Sathya Sai Organisations need a special appreciation for this effort. 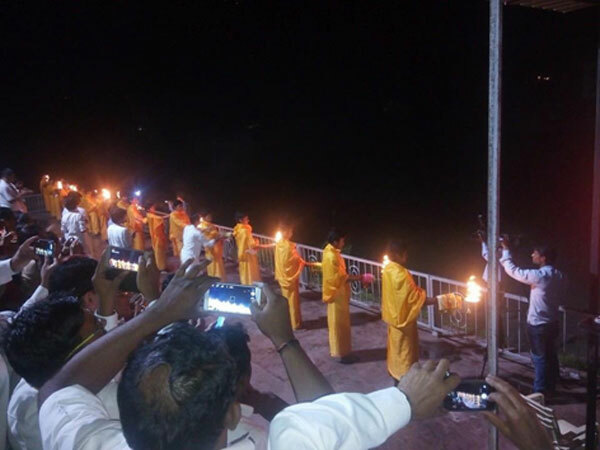 At around 8:30PM, the blessed devotees took part in the Ganga arathi which was followed by Swami’s arathi in Rishikesh which indeed is an emotional moment for all the assembled devotees. Earlier in the morning, Sister Karuna Munshi of Radio Sai interviewed some dignitaries from the Sri Sathya Sai Organisation. Sri. Naganand Trustee, Sri Sathya Sai Central Trust spoke in Hindi (with his South Indian dominated accent), excellently explaining the significance Sri Sathya Sai Organisation taking part in a rare event like this. He said it was all Swami’s grace that this could happen and the generations will remember the service rendered by the Sri Sathya Sai Organisation. Many state presidents, office bearers of Sri Sathya Sai Organisation were also interviewed. The important day of this three day programme will be on September 10th where the day will start with RUDRABHISHEKAM at the Sri Sathya Sai Ghat, again presided over by Brother Veda Narayana and team. After the inauguration of Shiva’s statue on the Sri Sathya Sai Ghat,at around 10:30am, Swami’s padukas which will be taken in procession from the Sri Sathya Sai School in Rishikesh will be installed in the Sri Sathya Sai Ghat by Sri. Rathnakar, Trustee, Sri Sathya Sai Central Trust. This Padukas will be worshiped for generations to come, by the devotees who will be visiting the Sri Sathya Sai Ghat in Rishikesh. At 5PM the chief Minister of Uttarakhand, Sri. Harish Rawat will be visiting the Sri Sathya Sai Ghat to inaugurate the statue of Mother Ganges and statue of Vishnu and to personally appreciate the noble gesture from the Sri Sathya Sai Organisation. This will be followed by bhajan programme by veteran bhajan singer Sri. Anoop Jalota . Back in Prasanthi, the beautiful festival of Kerala, Onam is round the corner and Prof. Mukundan, the State President of Kerala is already here in Prasanthi with thousands of devotees from Kerala to celebrate a week long programme in Prasanth NIlayam. Looking at this sea of devotees from Kerala, It seemed as if Swami has PRE-PONED Onam festival by a week. The Kerala Sai Organisation has planned some very unique programmes with talks by people from different walks of life. To start with it was the turn of Sri. Sabarinadhan, one of the youngest members of the Legislative Assembly of Kerala who spoke in length as how the world is progressing in the field of education, medicine and the rold to be played by the youth. He fondly remembered his association with Ratan Tata and team when they took up some innovative projects in Prasanthi Nilayam few years ago. This was followed by a close to a one-hour soulful rendition of Sri Vittal Vinod Bhagavatar which was followed by bhajans, arathi and prasadam. Puttaparthi in the recent past is buzzing with lots of activities and Onam season is always special.